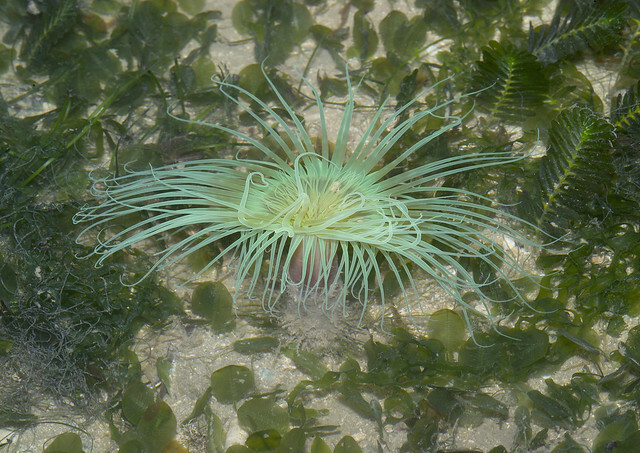 In Singapore's lush seagrass meadows live many sea anemones. Although they appear harmless, sea anemones are actually predators! Yet, some shrimps have adapted to living on sea anemones without being harmed. While other sea anemones hitch a ride on other sea creatures. 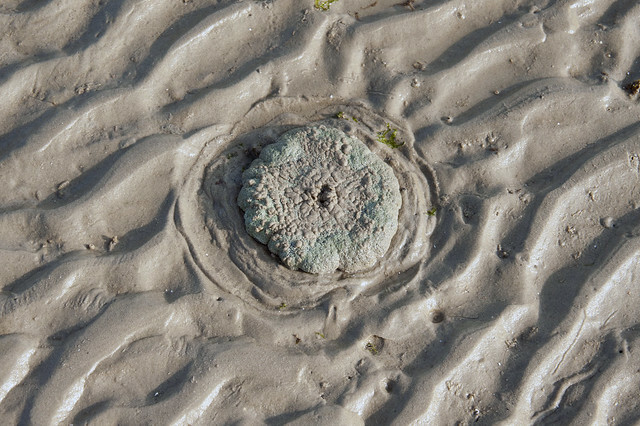 Here's some fascinating sea anemones of our seagrass meadows. Sea anemones can sting! Just like their cousins the jellyfish. But not all sea anemones have stingers powerful enough to harm humans. The Haddon's carpet anemone's tentacles feel sticky to our touch as the stingers attach to our skin. Hundreds of sticky tentacles are arranged on a large disk with the mouth in the centre (thus called the oral disk). Below the disk is a long body column buried in the ground. 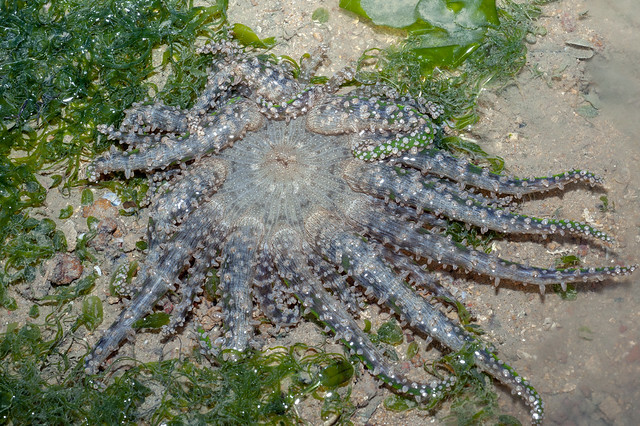 The sticky tentacles grab animals that blunder or are washed into them. The disk can contract quickly to hold on to the luckless prey, which is eventually transferred into the mouth. 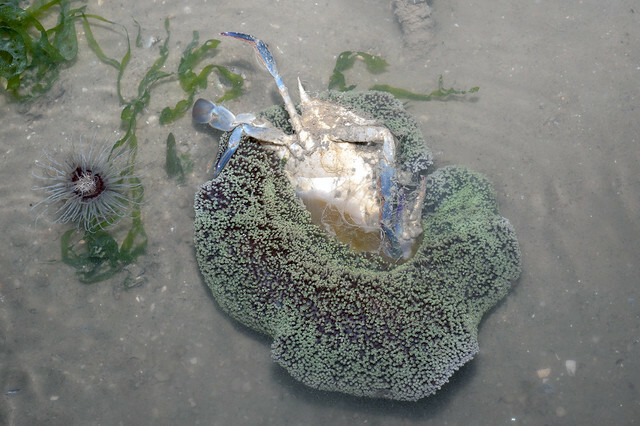 Some large creatures that are swallowed up by carpet anemones include fishes and crabs. More photos of what our carpet anemones have been seen swallowing. 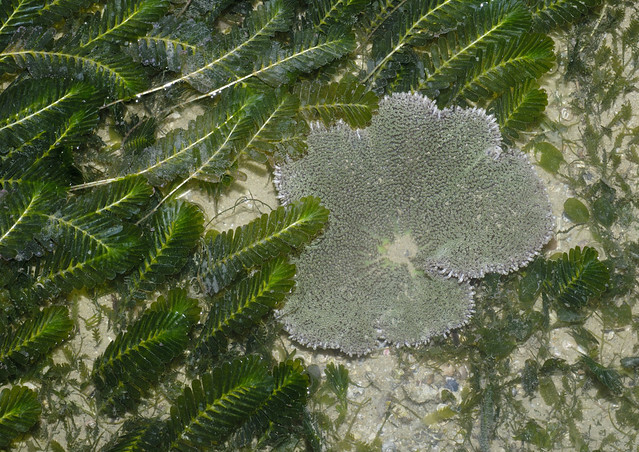 Carpet anemones are also related to corals, and like them, harbour symbiotic single-celled algae (called zooxanthellae). The algae undergo photosynthesis to produce food from sunlight. The food produced is shared with the sea anemone, which in return provides the algae with shelter and minerals. The algae are believed to give the anemones their different colours. encountered sea anemones on our seagrass meadows. They come in many different colours and patterns. Despite the deadly stinging tentacles of sea anemones, some shrimps have adapted to live happily among them. This includes the chubby Peacock-tail anemone shrimp. Usually a pair of male and female shrimps are seen together. The female is often larger and more brightly marked with more and larger white spots. The male is more slender and more transparent. 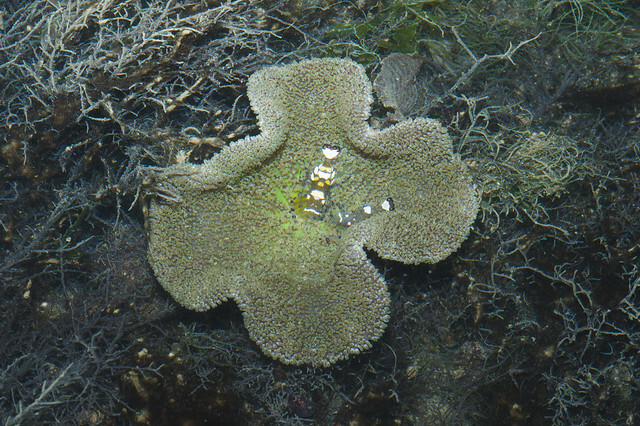 Haddon's carpet anemones may also be home to Tiny anemone shrimps. Just 1cm or smaller, they are transparent, sometimes with a tiny bar on the side of the body. One sea anemone may have many of these nearly invisible shrimps. 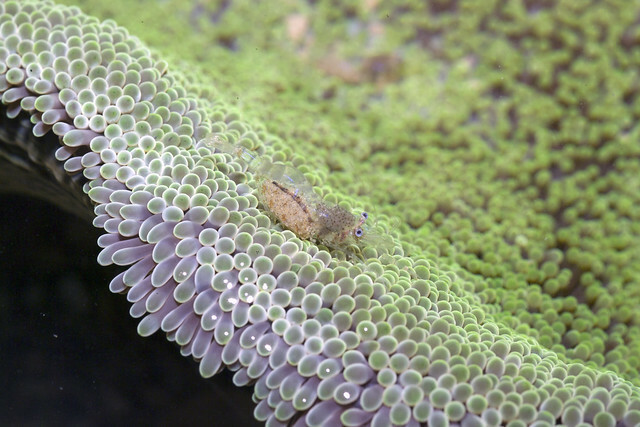 This Tiny anemone shrimp is packed with eggs! Sometimes, you may see small anemones hardly bigger than a seagrass blade. These may be Mini carpet anemones, and not necessarily juvenile Haddon carpet anemones. 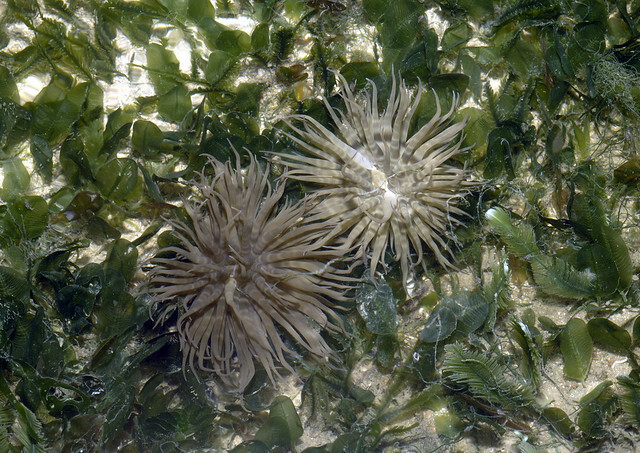 Even tinier sea anemones with long tentacles are sometimes seen in large numbers on seagrass blades. 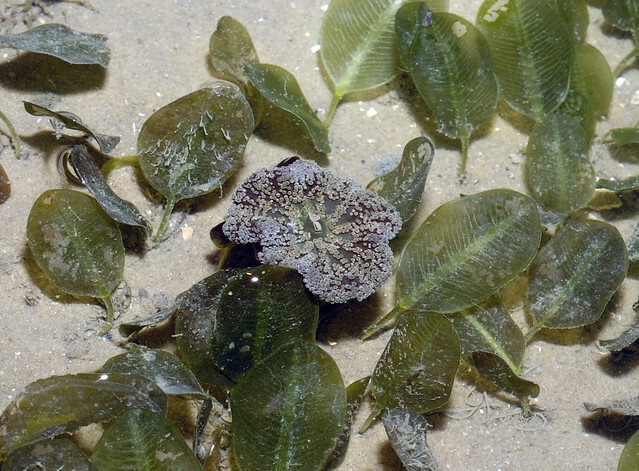 These are Seagrass anemones, which have yet to be identified. 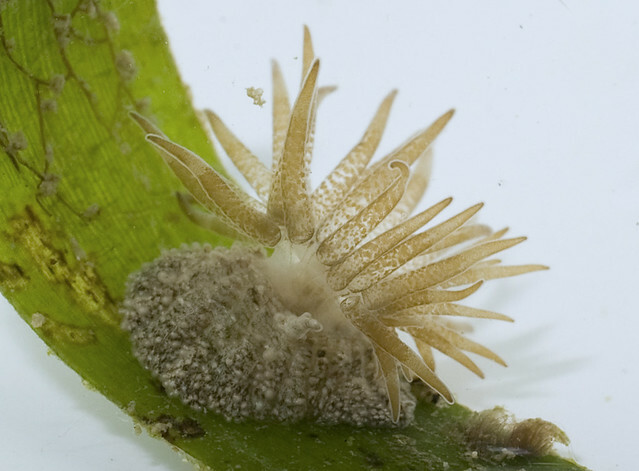 Another kind of tiny sea anemone often hitches a ride on living snails. One snail may have several anemones! Possibly, the stinging anemones protect the snails from smaller predators, while these scavenging snails stir up delicious snacks for the sea anemones. 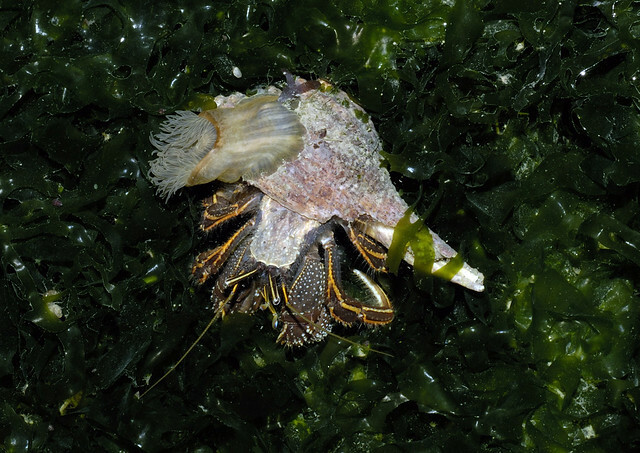 Larger sea anemones have been seen hitching a ride on a shell occupied by a hermit crab. The relationship between the two kinds of animals are probably similar. Sea anemones can swallow large animals as their body column can expand greatly. This Tiger sea anemone is swallowing a Spiky sea pen! Some sea anemones DO have stingers that can affect humans. The Fire anemone does indeed pack a powerful burning sting and should not be touched. 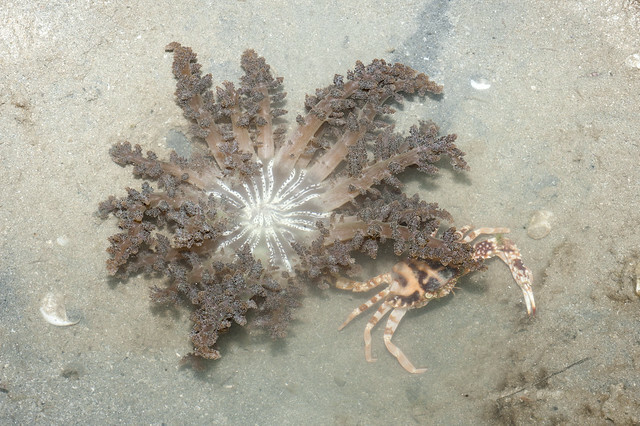 The crab in the photo may be sheltering under its tentacles from predators that would avoid the sea anemone. The scary looking Haeckel's anemone is as nasty as it looks. Don't touch it! There is also a green version of the Haeckel's anemone. 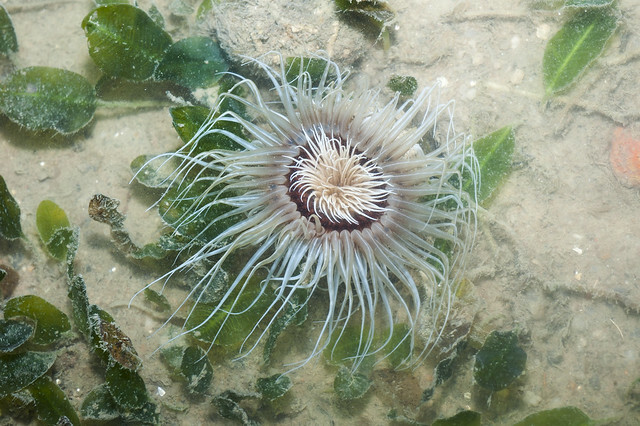 Not all sea anemones are permanently stuck to a hard surface or burrowed into the ground. Like a mobile mop, these Swimming anemones do indeed swim with undulations of their many many tentacles. But most of the time, they cling onto seagrass blades with their tiny foot on the bottom of a short body column. 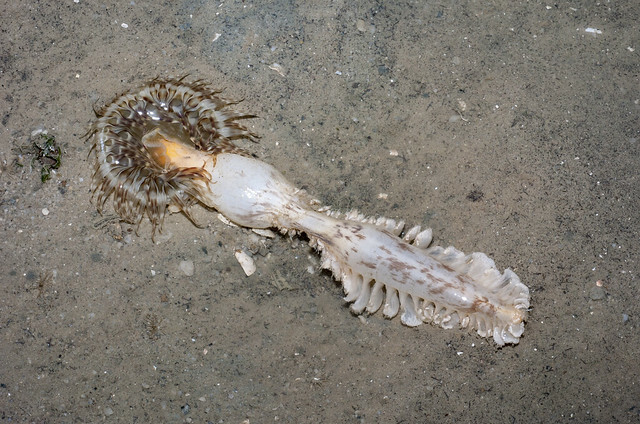 The Common peachia anemone has a long white body column that is buried in the sand with its few tentacles spread on the surface. Singapore is full of new anemones! 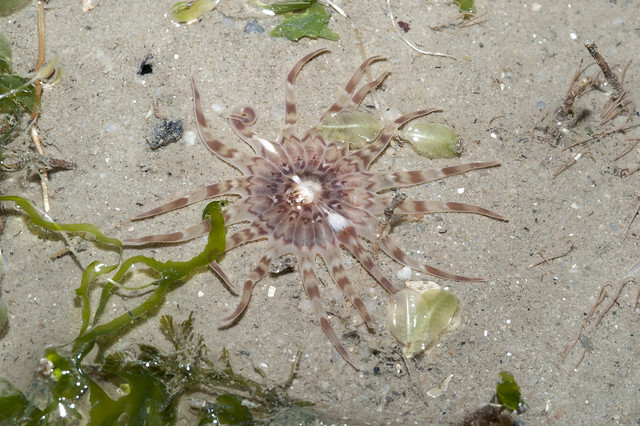 Although it looks similar to the Common peachia anemone, this anemone has a brown body column and other differences. It is a new genus and species described from Singapore named Synpeachia temasek. It was only described four years ago in 2014. There is so much more to learn about our sea anemones! Although often mistaken for them, these are NOT true sea anemones. Cerianthids have an inner ring of short tentacles, and an outer ring of long tentacles. They build and live inside a felty wooly tube (like a sock) and thus sometimes called Tube anemones. They come in a wide variety of colours and also called Peacock anemones. But these burrowing animals are not sea anemones. Be kind to our sea anemones! Should I 'save' animals trapped in an anemone? Please don't. If you do, you will be depriving the anemone of a meal. It might not get so lucky again for a while. 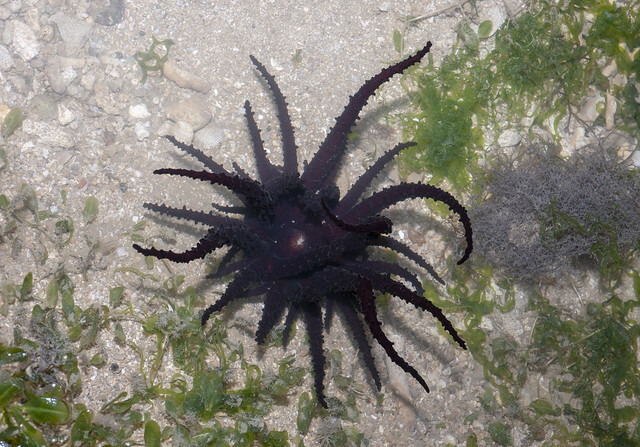 The animal that you 'saved' might also not survive if it was badly stung by the anemone. Should I feed the anemones? Please don't. Anemones know how to feed themselves. You might hurt the anemone if you put the wrong thing on it, for example a toxic animal. If you put another living animal on an anemone you will be hurting two animals. 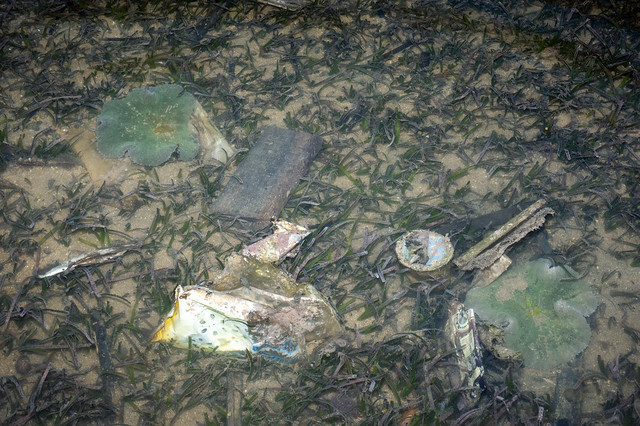 Please don't put objects such as litter or dead crabs on an anemone either. Should I 'save' the poor anemones out of the water? 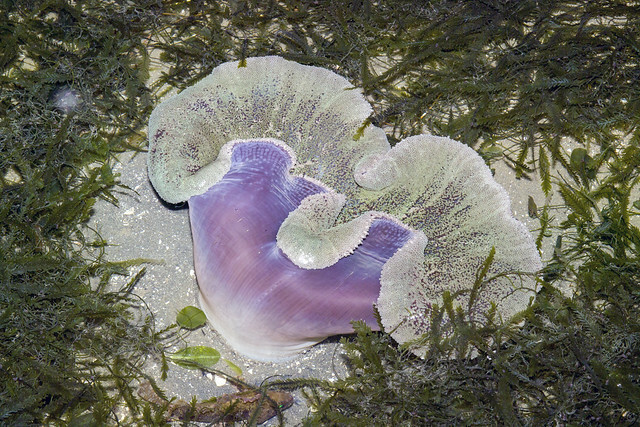 Carpet anemones and other anemones of the intertidal zone can survive for a short while out of water. Don't try to move them or 'help' them in other ways. To conserve water, the oral disk shrinks to reduce the surface area and mucus is secreted to cover the mouth and delicate body parts. Sediment gets stuck to this mucus, probably providing some shade from the sun. 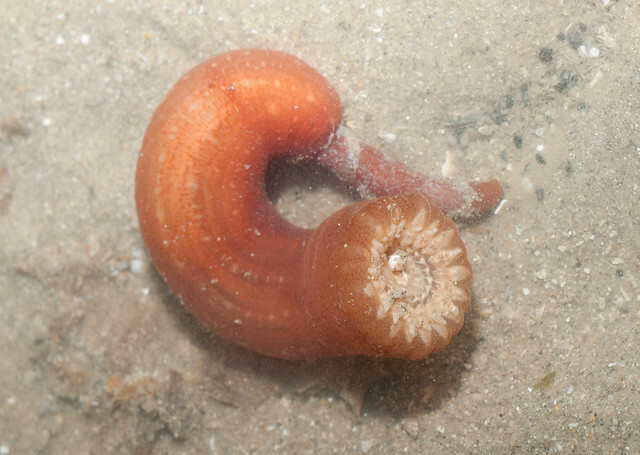 Smaller anemones may also tuck the oral disk into the body column at low tide. 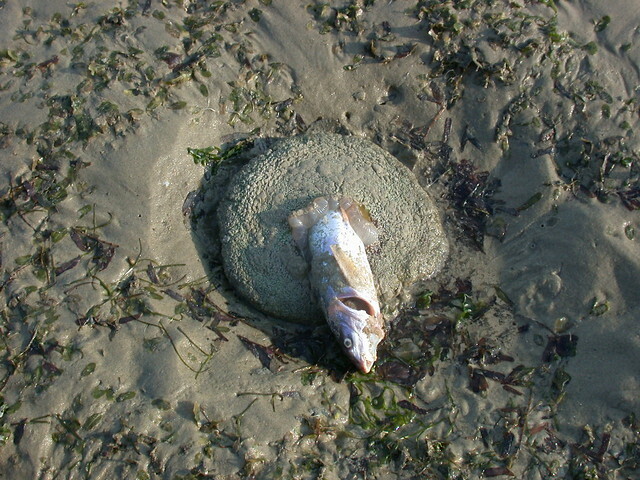 When the tide comes back, the oral disk furls to the full size. We can do our part by not stepping on the sea anemones. Also, by not littering. Where can I see sea anemones in Singapore? One of the best ways is to join intertidal walks by NParks at Chek Jawa, Pulau Ubin. 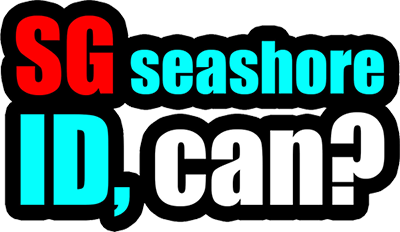 Or check out these opportunities to explore our shores through walks, or during volunteer work for our shores. 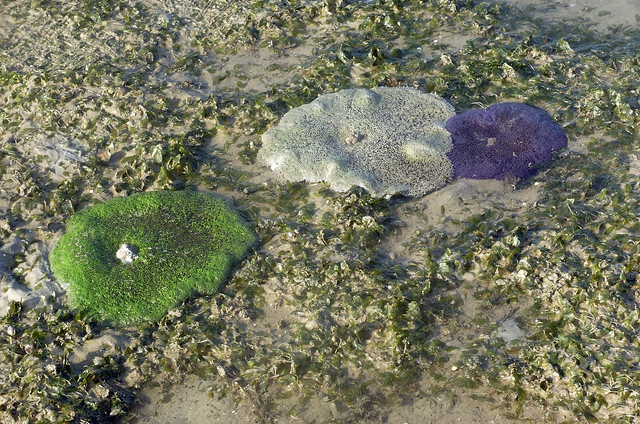 Learn more about Singapore sea anemones on the wild fact sheets on wildsingapore.